Slow Cooker Pork Carnitas - Easy Meal Prep Idea! - Home. Made. Interest. 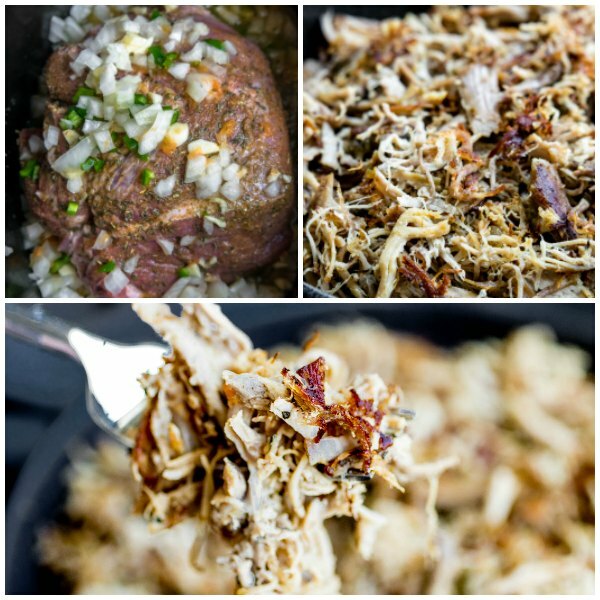 Home » Recipes » Main Dish » Slow Cooker Pork Carnitas – Easy Meal Prep Idea! Slow Cooker Pork Carnitas – Easy Meal Prep Idea! 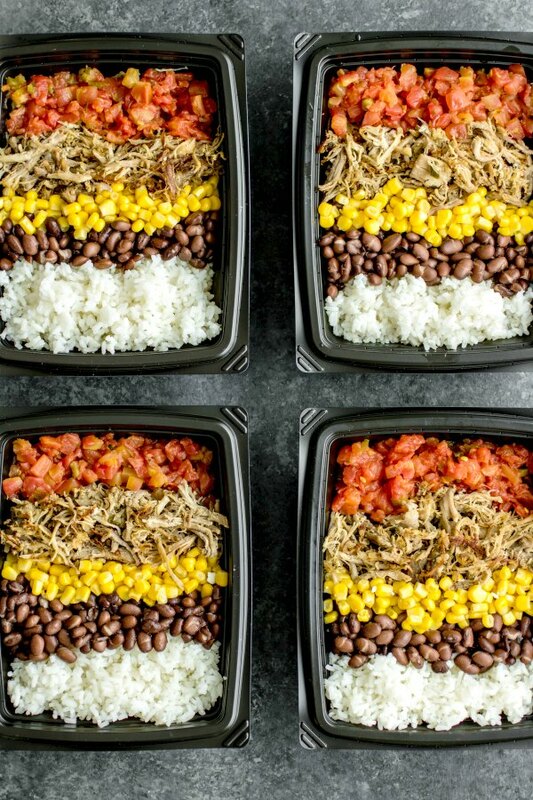 This Slow Cooker Pork Carnitas recipe is easy to make and is perfect if you’re looking for meal prep ideas for the week. Slow Cooker Pork Carnitas, plus all of the ingredients you need for a pork carnitas bowl, equals lunch or dinner all week long! Alright guys, I’ve finally jumped on the meal planning bandwagon and I have to tell you it has made such a difference in my daily routine. Easy meal prep ideas like this simple Slow Cooker Pork Carnitas recipe allow me to prep my meals on Sunday so during the week I don’t have to worry about waking up early to make lunch or rushing home from work to make dinner. My only regret is not starting it sooner. I’ve been making Slow Cooker Pork Carnitas for years. You just throw the ingredients in a slow cooker and let it cook for about 6 hours. The result is super moist, tender pork that shreds apart easily, and the flavor…OMG guys, it has so much flavor from the onions, garlic, orange juice, and a little spice (VERY little) from the jalapenos. The special thing about pork carnitas is that the meat is slightly crisp. You get that crispness by taking the shredded meat and pressing it into a skillet, letting it cook for a few minutes to crisp up the bottom. For me, part of meal prepping is making better decisions about what I eat. I find that having everything made ahead of time and portioned out keeps me on track. 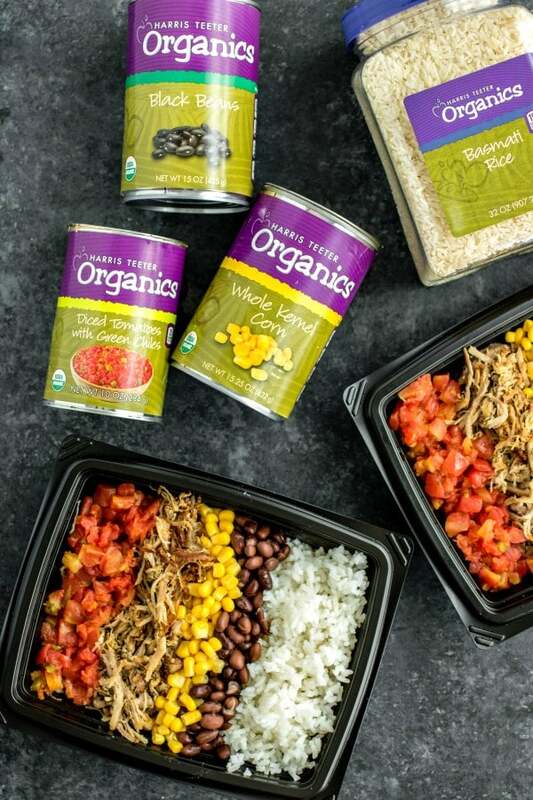 I know when people hear “organic” they immediately think it must be expensive but I shop at Harris Teeter and for less than $20 I can get all of the Harris Teeter Organics ingredients I need to turn my Slow Cooker Pork Carnitas into 6 Pork Carnitas Burrito Bowls. That means I have lunch, or quick dinners all week! Harris Teeter has 351 Harris Teeter Organics products to choose from and all of them are free from GMOs, synthetic fertilizers/herbicides/pesticides, artificial preservatives/colors/flavors, antibiotics or growth hormones. Some of the Harris Teeter Organics products are even priced BELOW conventional, non-organics brands. 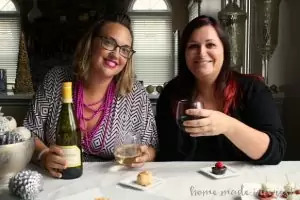 They are a great solution to making good choices about what you eat and not breaking your wallet doing it. Use 6 resealable, microwave-safe, containers. The bowls are stored in the refrigerator and throughout the week I can just pull them out, microwave them for 2-3 minutes to warm them up, and lunch/dinner is served. 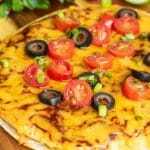 If you want to take it up a notch you can add a little Harris Teeter Organics Shredded Mexican Cheese, and Harris Teeter Organics Sour Cream. Yum!! Harris Teeter offers a satisfaction guarantee. So, if you aren’t satisfied with a Harris Teeter Organics item for any reason, you can return your item to the store and Harris Teeter will refund your money as well as replace the item with a like item of your choice (restrictions apply). That’s on all Harris Teeter products so you really can’t go wrong with giving them a try! 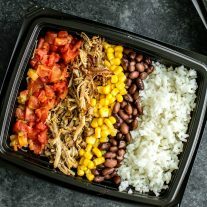 This Slow Cooker Pork Carnitas recipe is easy to make and is perfect if you're looking for meal prep ideas for the week. Slow Cooker Pork Carnitas plus all of the ingredients you need for a pork carnitas burrito bowl equals lunch or dinner all week long! Rub olive oil all over the pork. In a small bowl combine salt, dried oregano, and cumin. Sprinkle it over the pork, rubbing it into the pork to cover it. Place the pork in a slow cooker and add the onion, garlic, and jalapeno. Let some sit on the pork and some fall into the slow cooker. Pour the juice of 1 orange over everything. Set slow cooker to high for 4-6 hours.Cover and wait. When the pork has finished cooking it should be super tender. Remove it from the slow cooker and use two forks to shred it. Skim the fat off of the top of the juices in the slow cooker and pour into a measure cup to use as you cook. 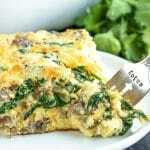 In a large skillet heat the remaining 2 tablespoons of olive oil over medium high heat. Add the shredded pork pressing it into the pan. You will probably need to do this in batches so you don’t crowd the pan. You want all of the meat touching the pan. Pour about ½ a cup of the reserved juice over the shredded pork and let it cook for 3-4 minutes until the meat gets crisped and brown on one side. 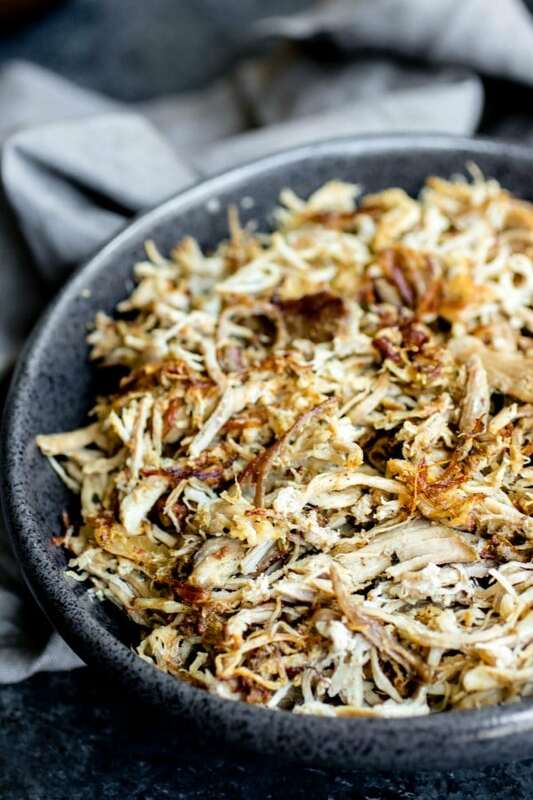 Remove from the pan and continue the process until all of the shredded pork has been crisped. Yes! 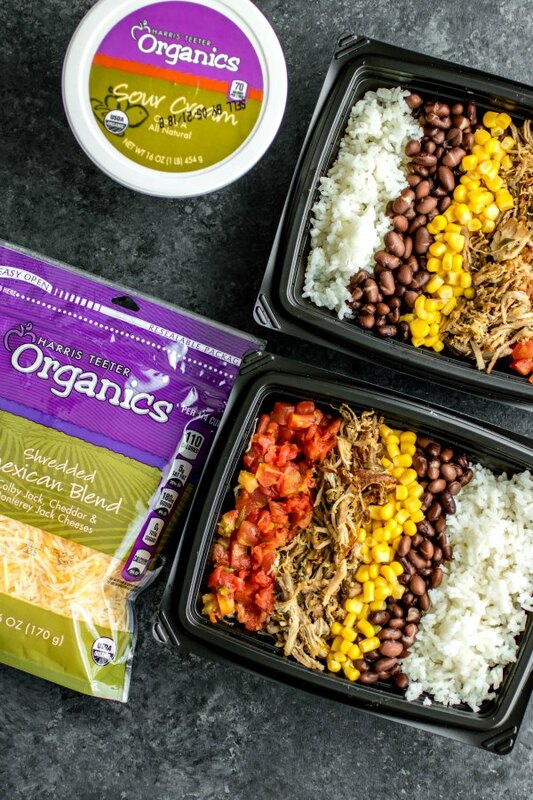 Love this meal prep idea! Isn’t it SO nice when you come home for a super busy day and you’re like, “oh wait, dinner’s already done.” THE BEST. 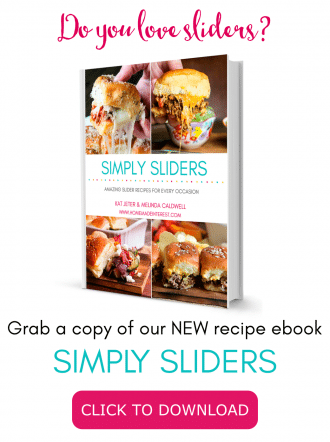 Plus, extra bonus points for slow cooker recipes! Tasty food with no fuss, can’t wait to try this. Wow this is one super easy to make meal. It looks and sounds so flavorful and delicious. I see this in my lunchbox soon. I’m loving this meal prep idea! Using the slow cooker makes it super simple, and it makes meal throughout the week a cinch. Cooking is minimal in all aspects. This looks awesome, too!! Love anytime I can meal prep. Harris Teeter has amazing products and this is a fabulous pork carnitas to eat throughout the week. I love cooking a big pork shoulder in the slow cooker, and using the meat later! Makes cooking so much easier! I do like your seasoning – have to try that, with the orange. And I just moved near a Harris Teeter and have been impressed by the quality of their products! 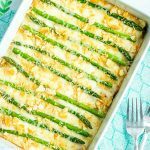 This looks so good and the perfect thing to make and eat all week long! I wish I were better at meal prep. You’ve given me a little inspiration for this week and for that I am very thankful! I was looking for more slow cooker recipes!! These carnitas look so easy to make and super delicious!!! 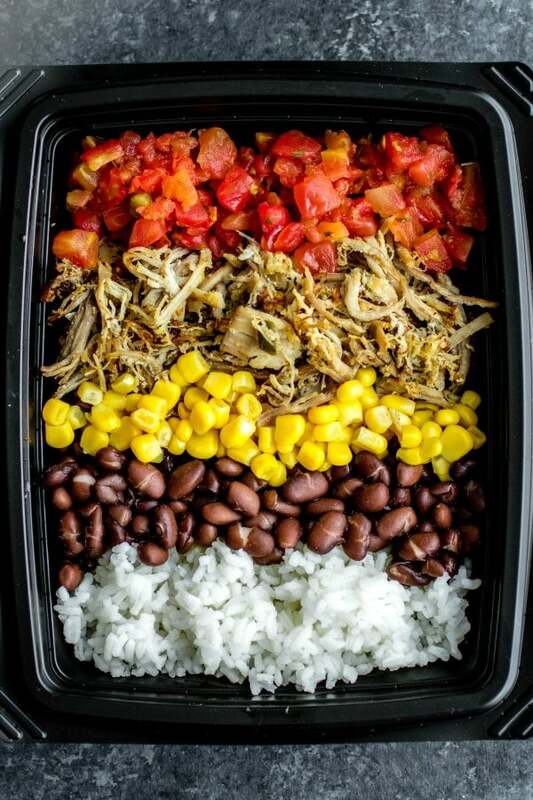 Meal Prep dishes are the best! 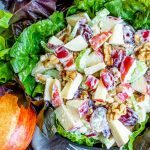 Great recipe, simple ingredients and beautiful pics! I love carnitas! Especially when they can be made in the slow cooker like this. Perfect for tacos! I love pork carnitas and I love any recipe that helps me with meal prep! This one is a keeper!